Often, it's best to create a study block for when you are in classes and another block for after you are done with classes, when you have time to focus on the exam. Study blocks are also helpful if you have a lot of resources to cover. You can dedicate a study block for a given set of resources to cover one set at a time, or to go through a book again. Study blocks help you customize your study plan to fit with your other commitments as your schedule changes. 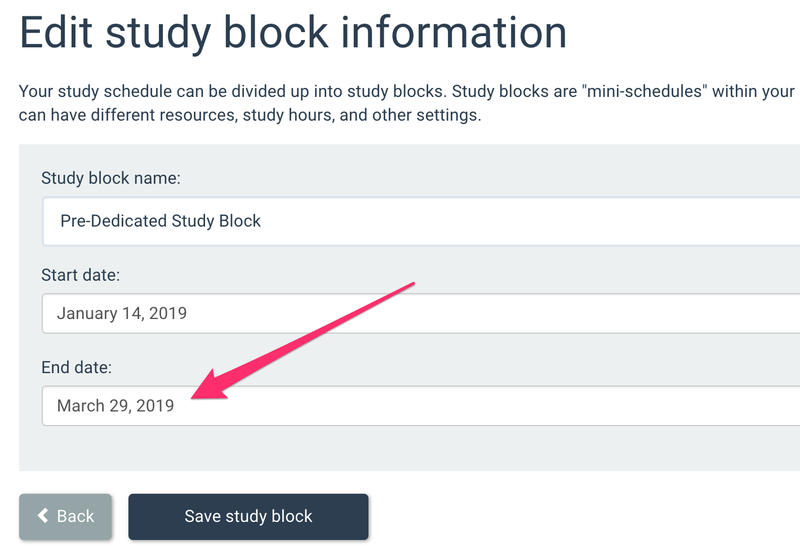 If you don't need this feature or aren't sure, you can use the default settings: one study block that spans the entire length of time before your exam. If you need to change the start or end dates of your start blocks, or add and remove study blocks, you can always change your settings by clicking Edit, then Edit your schedule, and clicking on the dates listed under the study block of your choice. Cram Fighter allows you to create overlapping study blocks as well! Users find this feature perfect for going over several resources in the same time period, but with a different focus or subject order.